Are you stuck in a rut because of a painful past event? Are you feeling depressed, stressed and very unhappy as a result? Do you want to transform your life and program you mind for everyday success? I have been there, I know how crippling and demoralising this can feel. This is why I have written “How to Turn Your Pain into Power” designed to empower you to get out and stay out of that rut. • Change negative thought patterns to access the power within. 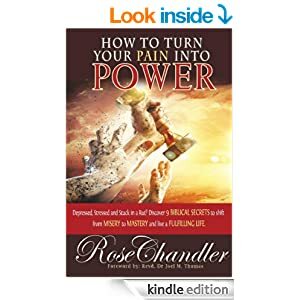 • Develop and deploy Massive Intelligent and Deliberate Actions M.I.D.A.s ™ to “Turn Your Pain into Power” Get ready for a turnaround To Your Success! Buy the book on Amazon (any country).